I discovered that A.J. Antoon, a brilliant young American stage director, was also very interested in adapting KING OF HEARTS for the musical stage. We spent six months trying to get the rights since KING OF HEARTS was a French film. At that time there were at least ten other producers around the world fighting for the same rights. I had fallen in love with this story and we both had become very excited about the possibilities of the project, so the thought of losing the rights to someone else was a most difficult prospect to face. Consequently we both went to Paris, wined and dined Phillippe DeBroca, the director of the film, for a solid week, bowled him over with our enthusiasm, and came home with the bacon. I’ll never forget the flight home. We were both so overjoyed we celebrated like crazy people all the way to Kennedy International. The first collaboration and the greatest creative period took place over two and a half years beginning in 1975. A.J. Antoon and I brought together a book writer and lyricist, Steve Tesich and Jacob Brackman, and together we began a work process that was many times crazier than the show itself. Steve Tesich was then a little known Yugoslavian playwright who had had several plays successfully produced at the American Place Theatre in New York. Since then his career has blossomed. He won the Oscar for his screenplay for BREAKING AWAY. We found Jacob Brackman by reading the backs of Carly Simon record album covers. I had always loved her lyrics and found much to my surprise that Jacob Brackman had written quite a few of the better ones. Jacob too is a screenwriter of some repute having written KING OF MARVIN GARDENS with Jack Nicholson and TIMES SQUARE. Little did I know that I already had started one of the craziest experiences of my life. We spent three years working — casting, writing, exploring, and developing KING OF HEARTS. In that time I think I had one of the most intensely creative periods of my life. To search the hearts of these lovable people every day for three years gave me a rare insight into the ways of lunacy. And the play’s theme, “Who’s really crazy?”, struck home in countless fashions. My father fought in World War I in France in the trenches. I had long detailed discussions with him about his experiences. I went to several asylums to work with the inmates and learned much from them. I studied French classical and folk music, listened to all the pop war songs of the day and to a great deal of the classical music of the age. We spent two years, three of four days a week, five or six hours a day, in deep discussion about the ramifications of every little scene, song, note, word and lyric. These meetings were the pure joy of the experience — and they were full of creativity, laughs, tears, revelations, and yes, some fights too. But they were the epitome of theatrical collaboration and I must say they were probably the best times I ever had with KING OF HEARTS. In the course of that time, Jake and I wrote fifty or sixty songs together which we either threw out, rewrote and then threw out, or rewrote, rewrote again and then kept. I think CLOSE UPON THE HOUR is probably the only song in the show that was begun and finished in two days. On the first day I wrote the melody, gave it to Jake that night, and he gave it back to me the next day with a beautiful lyric. Not a word or note was ever changed. Fortunately, that’s not always how it was. I say “fortunately” because the joy of my work often comes in the rewriting, the thickening, the deepening. That is when the great collaborative process of the theatre really takes shape — when you play a new song for the other guys and they come back at you with thirty great new ideas and then you try to decide how to combine them all into one poor little melody or song. 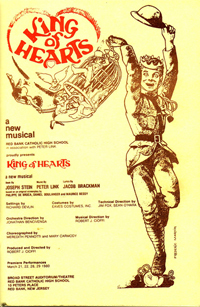 KING OF HEARTS first opened at the Westport County Playhouse in the fall of 1977 where it had a two week run and starred Robbie Benson. I’d say the show was about seventy-five percent there. The first act went like gangbusters and the second act fell a little short. But all in all it was a very good learning experience for everyone. We had a good idea of where to take it after that in terms of revisions. At that point Joe Kipness, a wonderful man, decided to produce it on Broadway and then the downfall began. I’ve always thought that what happens in the play happened to the play. The outside world came in with their money and machines and worldly ways and brought them with untold confusion. Antoon, my dear friend and partner, was fired and replaced by a director who never really understood the piece. The worst mistake came the day we contracted the Minskoff Theatre, New York’s second largest, as the place to showcase this sweet, simple, little musical against the wishes of all the artists involved. Money then seemed to dominate the decisions and as is the case in most Broadway shows, money rules.During our pre-Broadway tour, we opened in Boston with a new cast to great reviews (in a smaller, more intimate house) and tremendous audience reception. After a four week run we came charging into New York City with a hit. The two weeks of previews in New York went fabulously — sold out and standing ovations every night. Though I had blind hope, I knew in my heart that we had troubles.The sound in that big barn of a theatre was problematic and the theatre was just too big — we had resculptured the show to fit the theatre and it was now coming off big and brassy. I feared the worst and hoped for the best. And even though the audiences laughed, cried, and cheered, we opened to mixed reviews in the middle of a three month newspaper strike. Two million bucks down the drain. And an incredible sadness in my heart. The show ran another five weeks and gained each week. The story and heart had somehow managed to shine through all the brassy trappings. The theatre owner had his own ideas about our survival. He kicked us out in favor of THE ICE CAPADES. Now there was a show that belonged in the Minskoff. It would have cost another hundred thousand to move the KING, so it closed.Consequently the musical like the film was destined to become a cult classic. Normally shows that are not successful on Broadway become resigned to oblivion. In this case, the KING would not die.The version offered now is the result of several productions following the demise of the Broadway one. 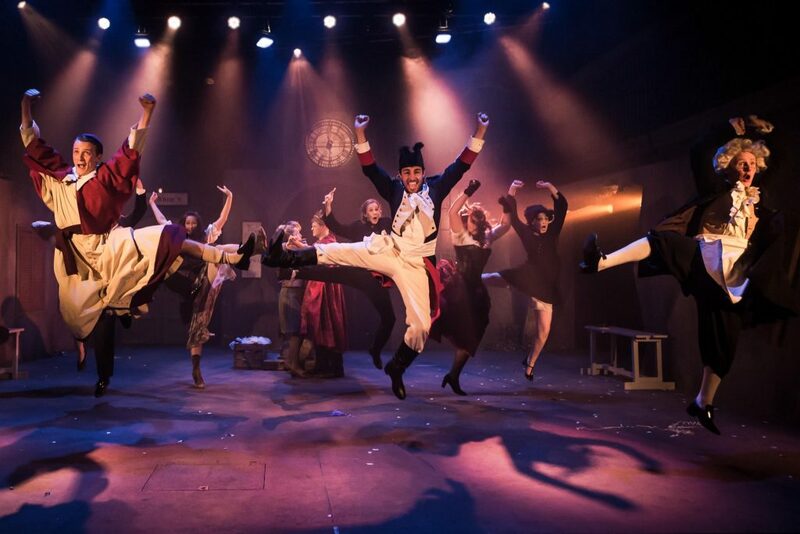 The major changes occurred during a production at the Royal Lyceum in Edinburgh. Most of the Broadway “improvements” were discarded and it became again what it had begun as — a labor of love. The musical continues to enchant its audiences internationally with productions in Japan and London and the United States and recently has become a fully digitized package leasing the musical to theaters around the world. Those interested should contact “Link Theatrical Leasing” for a perusal script, score, cast album, and Leasing Agreement. 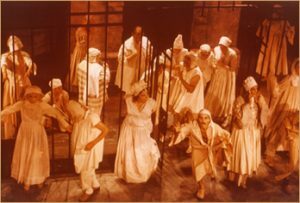 There are several basic themes that run through the play, e.g., anti-war, the family against the world, and there have even been those who have suggested that the play actually promotes insanity. To me, it is simply a play about the innocence of love — something beyond what we achieve in our every day life. It speaks of the joy of living in a simple time far removed from the real craziness of the outside world. I hate to correct the composer, but I have the Playbill for this show for the Westport Country Playhouse. (Well their version of a Playbill.) This show ran there August 30th through September 10, 1977. So it is several years earlier than suggested in the article. Jeff, Thanks for the correction. Much appreciated!